Back when I was in my teenage years, I was never one to care about the way I look. I would dress up pretty differently, weird to most, but that's just it. While most girls are learning to shape their eyebrows, put lipstick and other cosmetics on their faces, I was running around playing tag with younger kids. That makes me a late bloomer when it comes to real, technical beauty care and the likes. Up to these years I still have that fear of putting on too much of anything on my face. I don't have many problems with my skin as I still do look and feel too young for my age. But, I could never hide the fact that finally, I have to learn to take and treat myself, especially my face, better. I wanted to stick to natural if not organic, cosmetics or beauty maintenance stuff. I was actually hesitant to try, but with the belief that it is made without the harmful ingredients present in most commercial ones, I did. These products are from: WM Nature Touch. 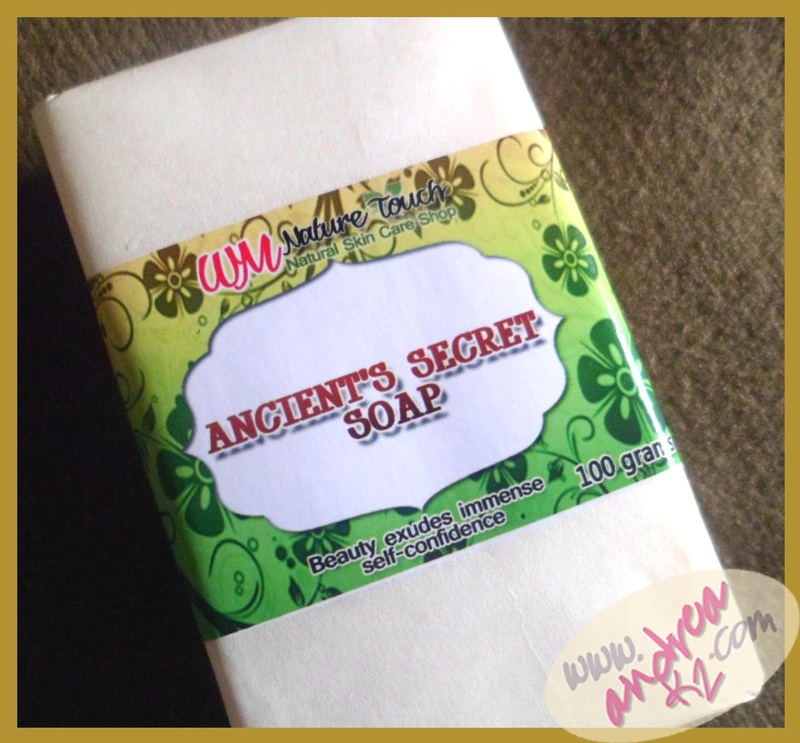 My favorite in the items sent to me is this Ancient's Secret Soap <----click this link to get to know more about its description. Being exposed to a lot of organic products, this one actually smells organic yet very pleasant. It is said to have pure goats milk, emu oil, olive oil and bengkoang. It's' very soft on the skin, lathery even, keeping to its promise a moisturized and rejuvenated skin afterwards. I've heard quite the hypes about using gold as part of keeping your skin young and wrinkle free. Comparing most of the time to the beauty that of Cleopatra's. Who wouldn't want to be bathe in gold??? The 24k Gold Toner works as a great cleanser. My routine after washing my face both in the morning and at night is to put or use the toner. The effects may not be easily visible (as to whitening, etc. ), but you can very well feel a hint of tightening on the face. Pores feels and looks smaller making the skin look more smooth and clean, with the hopes of keeping away the appearance of wrinkles and fine lines (since I don't have much of that yet, and I intend to keep it like that). 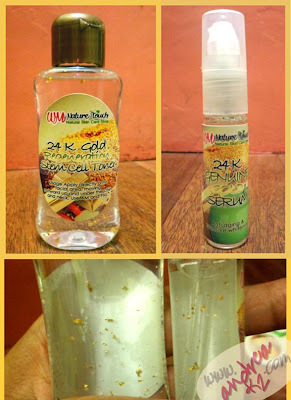 The 24K Gold Serum is an additional routine I do at night following the toner. I keep the serum on my face while I sleep. It gives it more elasticity. 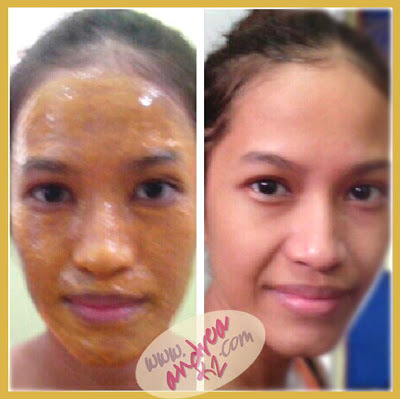 I think you should say that's hydrating your skin with collagen which is an essential ingredient for youthful skin and reduce, yet again, wrinkles and fine lines. 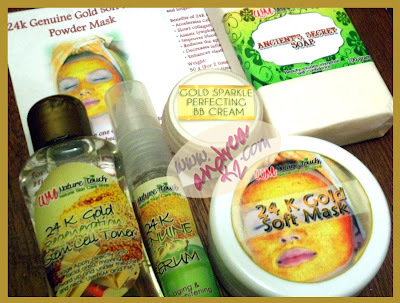 It's just best to use the 24k Gold skin care set to achieve its maximum effects. 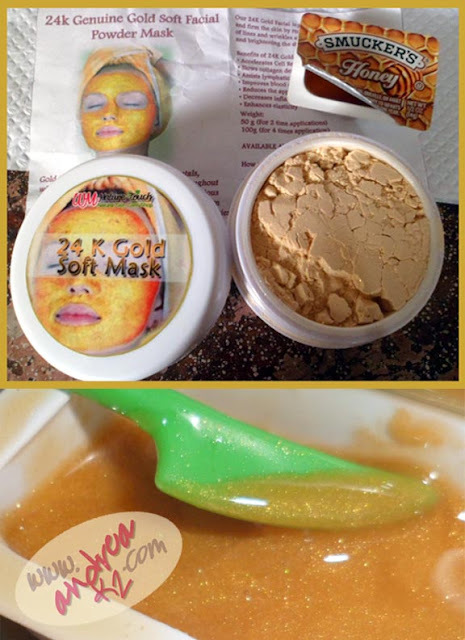 Now the 24k Gold Powder facial mask is what I enjoyed the most. Using it was a whole lot of mess but really fun to do. The instructions says you can mix the gold powder with water or honey. I of course thought honey would be better since "honey" itself has got a lot of known beauty benefits for the skin. In the picture you can see that I used Smucker's honey. I let it stay for more than 30 minutes... giving the honey a bit of time to dry up a bit. Keeping in mind that the longer it stays on my face, the better and the more my face absorbs what it needs from the mixture. It's sad the photo didn't catch the after effects that much, but the feeling after washing the mask off was really great!!! Your face feels relaxed, clean, and it has that really nice glow like you've just put some powder on. You get a glimpse of sparkly gold dusts here and there too. I'd say for maintenance and natural skin care, I'll be okay with these set. I'm looking forward exploring more about this. So, if you're after that GOLD experience, I'd say give these set a try. It would be best though if I also get myself some acne preventing skin care and such. I think I have a lot to learn about skin and face beauty care.